hen party, to a sophisticated show at your corporate event. 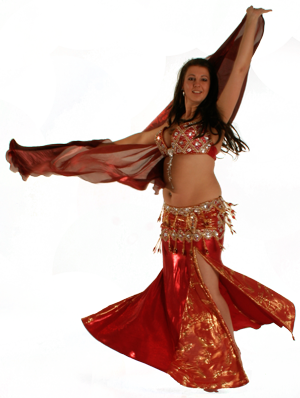 Claire is an experienced performer, adept at a range of styles of Egyptian Dancing and is used to performing in front of many different types of audience. She has performed extensively around the UK, at the Edinburgh Fringe Festival and even in Algiers. She is known for the expressive quality and variety of emotions she presents in her dance, ranging from cheeky, to powerful, to refined and elegant. Claire is available for performance bookings at all types of events including talks and demonstrations, parties, weddings, restaurants, festivals, hen parties and corporate events. She has danced at events as varied as formal dinners and balls, to club nights, health and cultural awareness events and Glastonbury Festival. what they want for their event, to ensure that her performance really adds a special sparkle! Claire is based in Newcastle upon Tyne, but regularly travels to perform at events around the UK...and further afield. "You really helped make the evening special... thank you"